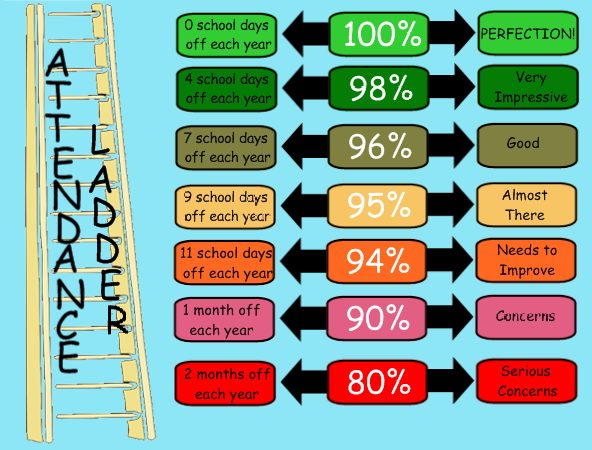 Children who attend regularly, do better, achieve more, and have better chances of success than those who don’t. Unfortunately, over the last term, we have had an increase of families taking holidays during term time. I must take this opportunity to say that I really do understand the reasons that parents are more attracted to booking holidays during school time, however as a school, our ultimate responsibility and concern is the educational welfare and achievement of your children and we would urge families not to do this wherever possible. On the other hand, we are not saying send your children to school when they are ill! Longer term, this can be worse for your child’s health (and others if contagious!) and they certainly will not learn well. However, all we ask, as a school, is that you keep in mind how important school is for your child’s achievements, particularly if you are unsure if they are really that unwell – and please be re-assured, that if they are, we will contact you to take them home for lots of TLC!